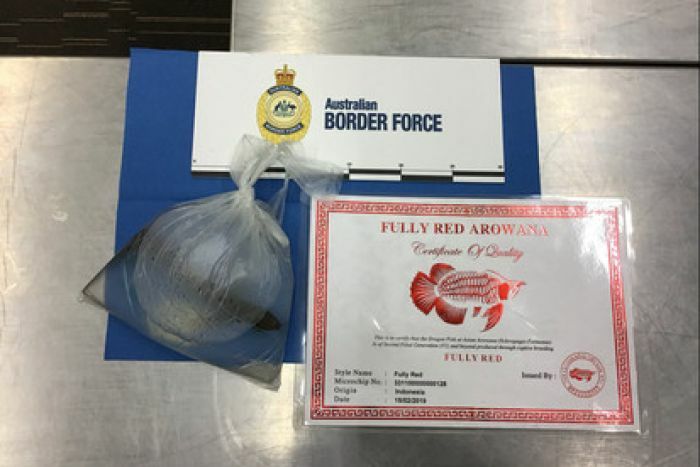 A man has been arrested for allegedly attempting to smuggle a rare fish into Australia in a bag of water around his neck. The 34-year-old Vietnamese man had landed in Adelaide after travelling from Malaysia when selected for a baggage examination, according to a statement from the Australian Border Force (ABF). The bag containing the fish was produced after a frisk search. The fish was identified as a Fully Red Asian Arowana, the trade of which is controlled under the international Convention in Trade of Endangered Species, to which Australia is a signatory. According to the ABF, the fish had to be humanely euthanised, as illegal imports of exotic animals can introduce serious pests and diseases that pose a significant biosecurity risk to Australia. “The ABF is committed to stopping the trade in rare animals and protecting our delicate natural wildlife from the potentially devastating impact of foreign diseases and predators,” ABF Chief Superintendent, Regional Command SA, Brett Liebich said. Meanwhile, this newsletter was facing major disruption from an even more major iced-coffee spill down our white shirt. At least it was cooling. It’s a slow news day today, and we could’ve run boring press releases or something more scandalous. Which one do you think we went for?